We love our volunteers and what better way to say thank you than to reward our volunteers! 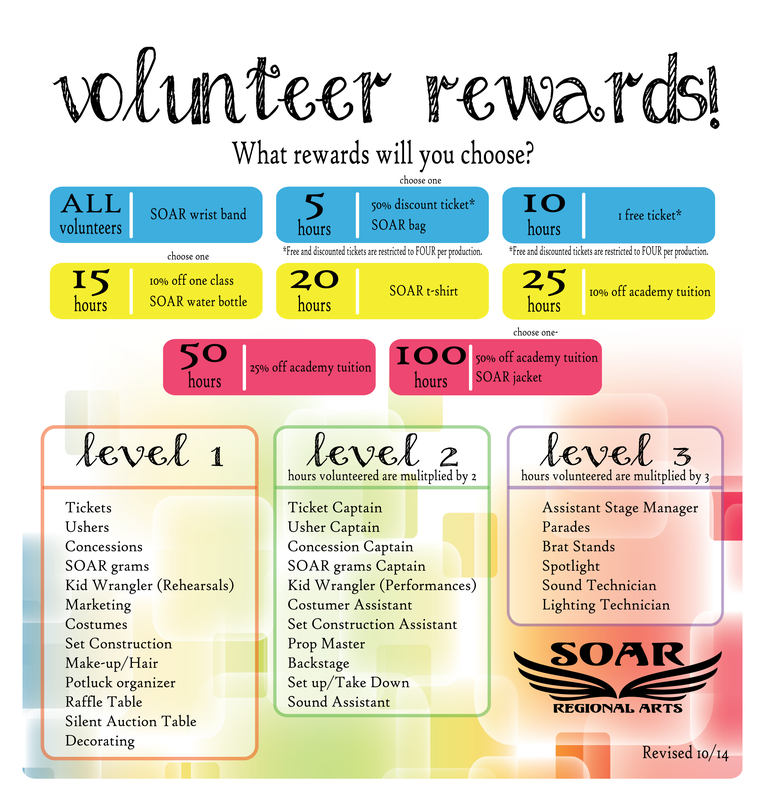 Sign up to volunteer and let the hours you put in earn you some fantastic rewards! Save your hours and spend them how you please! Want to earn a reward faster? Move up a level and earn it two time or three times as fast! Get your family in on the fun by combining your hours to get more tickets or save them for an even better reward! We designed the program to be flexible and give you the power to choose your own rewards! ​*Free and discounted tickets are restricted to FOUR of each per production. No purchase necessary. Must be 13 years or older to participate in the rewards program. Hours must be redeemed within two years. Hours can be combined into a household account for immediate family members. Rewards are subject to change and are available while supplies last. Levels are subject to change. SOAR Regional Arts reserves the right to end this program at any time. Positions listed are not available for all productions. Last day to redeem rewards will be announced during each production. Merchandise rewards will be available for pick up during dvd/photo pickup following the production.